TC Helicon specialise in producing professional audio equipment for singers, providing effects units and effects pedals suitable for use with guitars, bass' and other non-vocal instruments. 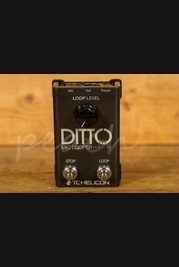 Dedicated to providing the best quality effects TC Helicon have a dedicated team based in Canada consisting of researchers and sound engineers who work closely with singers to provide great sounding effects units and pedals. Order your TC-Helicon product online today, if you'd prefer to try before you buy then head on down to our store based in Colchester and we will be happy to assist. Our team of experienced guitar enthusiasts are always on hand online and in store to answer any technical questions and to help you find the right product. Don't forget, if you order online and spend over £100 you'll enjoy free Next Day Delivery on orders placed before 3pm.